Composite Cranker- The slow graphite/fiberglass construction makes this the favorite crankbait rod of many pro fishermen. Composite Cranker II- A slightly heavier and longer version of the original composite cranker. The slow forgiving action results in less "thrown" baits. Head Turner- A popular pitching rod. It has the right action to accurately place jigs. Weightless Worm- Designed to fish "wacky" or weightless worms, it has the soft tip needed to make the cast but plenty of backbone to handle the fish. Flippin Stik- This is a stouter, heavier pitching rod for accurate placement. Amistad- One of the most popular "power" rods, the "Amistad" can handle grass and still has a sensitive tip to detect subtle bites. Heavy Cover Jig- A pitching or flipping rod with enough tip for accurate placement. 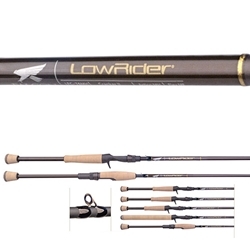 Cranker II- Designed for cranking, this LowRider delivers long accurate casts. XD Cranker- We designed this LowRider to cast the extra large crankbaits. Lizard Dragger- The legacy continues with the first rod designed to fish Carolina rigs. All 'round- As the name implies, this "all around" performer is a must have for every fisherman whether cranking deep divers, casting buzz baits, or slow rolling big spinnerbaits. All 'round F- A slightly quicker tip, gives this "all around" a more precise action.